All songs published by Chrysalis Music Ltd. Except "Song 2wo" which is published by EMI Music Publishing Ltd and "Galaxy" which is published by Far Out Music. 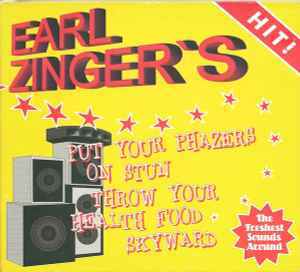 Ridiculous amounts of fun from Earl Zinger's debut PUT YOUR PHAZERS ON STUN THROW YOUR HEALTH FOOD SKYWARD. "On My Way Home" is a little bit of talk-sing organ jazz, while "Song 2Wo" is all about the dub thump. The humor comes to the forefront on "Escape From Ibiza," namechecking his downtempo-jazz-archnemesis, Rob Da Bank, (its sister track, "Got to Get to Ibiza" appears later), and on "Last Of The Great Bassline Hunters," which takes its topic only semi-seriously. He takes the theme from "My Favorite Things" and transposes it into his own "Go Round," or goes straightforward mellow with "Metropolis." And is that a delicate string section I hear on "Learning to Fly"? It sort of matches the slow accordion-tones on "Did They Write On You." There's also the excitement of the narrative on "Saturday Morning Rush," a free-flowing story of someone eternally worried about being late. The obvious answer to all that? Take a look at the title.